What is strategic alignment of projects? Before diving into the benefits, let’s think a little about what strategic alignment is and what it is not. Strategic alignment is not “return on investment”. It’s not “net present value” and if you’re simply using financial measures to evaluate projects you are absolutely not aligning your projects to strategy. Strategic alignment usually includes some financial goals, but it might also include business drivers such as market share or improving distribution efficiency. Strategic goals might include things like customer satisfaction or improving quality. When selecting projects, you typically turn your strategic goals into criteria that you use to evaluate how well a particular project is aligned to strategy and those goals can vary widely. So let’s assume you’ve gone through a project prioritization process and have selected a well-balanced, strategically aligned portfolio of projects. What are the benefits you’ll see? In this post we look at the impact of strategic alignment on project success rates and the data on this is clear. Projects that are aligned to strategy are 57% more likely to deliver their business benefit. They are also 50% more likely to finish on time and 45% more likely to stay within budget. Projects that are aligned with strategy deliver clear and quantifiable benefits to your organization. Those that are not aligned to strategy may deliver some financial benefit (they’d better!) but they don’t really help you achieve real value growth in the business. By killing off low-value projects and focusing resources on high-value ones, you will, naturally enough, deliver more value. The lack of executive sponsorship is a regular complaint when it comes to delivering projects. But let me ask you this... why do your execs not engage with a project? The answer’s simple; they don’t engage because the project simply isn’t important enough. It’s not strategically aligned. Align your projects to the strategic goals of your execs and they are likely to be far more engaged. We’ve all seen them - projects that just shouldn’t be there. Pet projects get jammed through, or projects that exist because they were important at some point in the past. Well, aligning projects to strategy means those projects go away… and in our experience, this “waste” is typically 10% - 40% of your portfolio. Imagine saving up to 40% - you’d be a hero! According to ESI, 72% of PMOs are being called into question by their executives. Why? Because they are not seen to add value…. But if you see the benefits listed in points 1 - 4, you will be seen to be adding heaps of value. Don’t just survive, THRIVE! And if you know where you’re going, you can use this in your kick-off planning to work out what you need to do to deliver the results. Instead of being focused on delivering a rather dry list of features, brief your team on what you’re trying to achieve, work backwards from there to “what needs to get done” and to “what key milestones and decisions are needed” and watch your project team really soar! Your organization: Simply put, the organization will be more likely to succeed and prosper. Not only is this good for your shareholders (or citizens or other stakeholders), but a well-performing organization usually translates into a happier work environment… which is nice. Your boss: Executives lose sleep over their ability to achieve their strategic goals. Wherever you sit in the organization, from CEO to mail-man, your boss has goals they are looking to achieve. 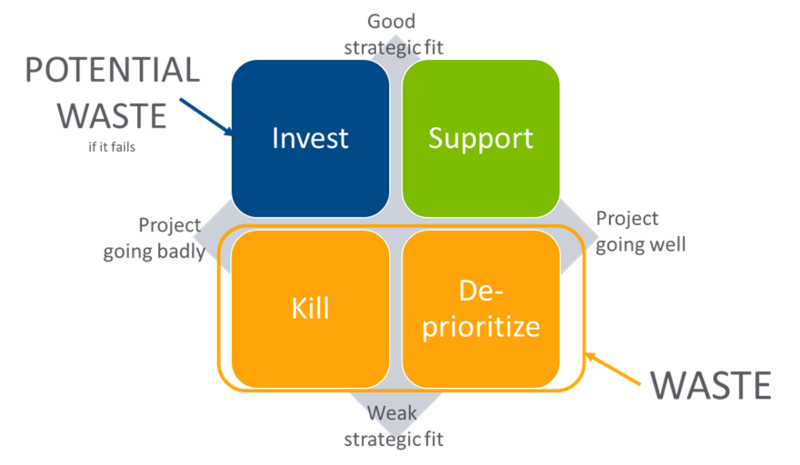 You can reduce the risk of missing those goals simply by aligning your projects to your strategic goals…. And that will help your boss sleep at night! Your career: Senior executives typically like problem-solvers, not bureaucrats. By engaging in the whole discussion around strategic alignment, you show yourself to be adding value and to be on “their side”. Of course, when you actually “deliver the goods”, they’re going to love you… and that’s great for your career! This podcast is a great place to really understand the issues. It will help you articulate the need and will even give you a few pointers on how to approach the process. As with most “change initiatives”, you need some kind of base-line - you need to know where you are right now. I recommend doing an audit of your current portfolio. Start by getting some picture of what “alignment means” and plot your portfolio on a 2x2 matrix something like this. You can sign up for a free session where we will show you how to do this. This will help you clearly identify where improvement is needed and what the benefit of an improved prioritization process would be. In any case, bite the (silver?) bullet and start working to better align your projects. It’s not just the organization that will feel the benefit!